This is my second attempt at the multigrain Struan from Peter Reinhart’s wonderful book: Whole grain Breads. This is no easy dough to deal with, and I remember now why i have chosen to put it off for a second trial. The high proportion of soaked grains (I used some seeds too), held loosely by 100% whole wheat flour, some butter, and honey; makes for a very sticky dough. I have used a sourdough preferment instead of a yeasted preferment, to give my dough a boost of strength, and flavor. 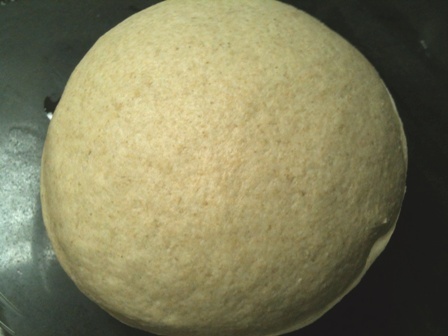 The final dough was leavened with commercial yeast @ 2.5tsp. I also chose not to add any more flour, so the dough was stickier but soft. Ultimately, the dough should come together coherently and form a ball. 1 – Use a mixer. Your hands will get messy with this one. 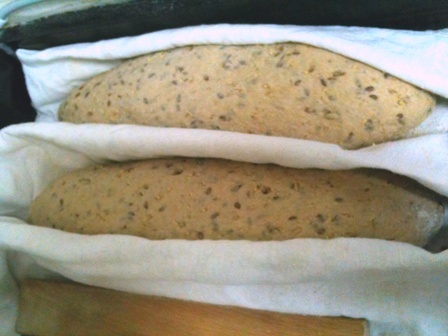 2 - Add some more whole wheat flour to the final dough. 2 – Bake it in pans, NOT free form. 3 – Apply egg wash prior to Poppy seed garnish. Water will not do the job properly. 4 – Bake *4 the recipe quantity, as this bread disappears almost immediately. Soaker: (Millet, Cracked Oats, Buckwheat, flaxseeds, Sunflower seeds, toasted sesame) in Hot water. The flavors, texture, aroma are all out of this world. The crust is sof, yet crunchy from all the popp seeds. The crumb is soft, crunchy, isn't chewy at all, and very aromatic. Overall, the bread isn't dense it is just closed textured. The bread was praised by all members of my household. The extra crunchiness brought by the addition of millet was just the right addition to compement the rest of the textures. This is one absolutely magnificent recipe from a magnificent bread book. What a nice looking loaf of bread. This one wouldn't last long around here either. Love the color of the crust and crumb. This might some folks back to their hippie days is SF :-) So you added extra non soaked millet for the crunch? Very nicely done as usual. Hehehe... I chuckled on the hippie-style bread era.. Actually, this bread is lighter than it appears. Millet was soaked in hot water, as were other grains and seeds. Millet retains its crunchiness even after soaking. What a wonderful loaf you have made! I know from experience it is no easy task to make a 100% whole grain bread with seed too and you have done a remarkable job. Looks delicious and very attractive too!!!! 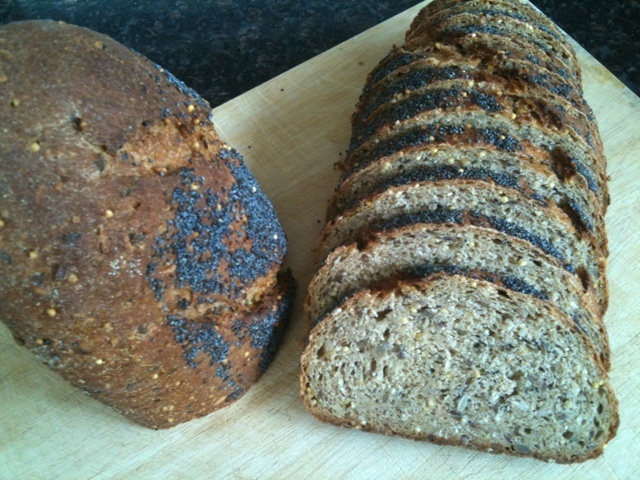 I love the poppy seeds and the shape of your loaf. I can see why all loved it! A beautiful loaf, Khalid! Words simply cannot describe the intensity of my appetite... I sincerely thank you for your post and your lovely pics, as your struan has inspired me to prepare a multigrain loaf myself. Whether in the near or distant future, I promise I will do so. So, how is the flour supply in Cambodia? Is bread flour available? The flour supply in Cambodia isn't as bad as many would think! However, if we're speaking of unbleached, unbromated, and/or unenriched flour, that's another story. Manufactured mostly by Hong Kong or Malaysia, bleached flour are in an abundance--the main ingredient in Cambodian-style French bread and Chinese steamed buns, which are ever popular in Cambodia. Thanks to the demand from a growing number of expats (i.e., foreign residents, mostly Europeans), as well as bakeries operated by foreigners, other flour varieties are being introduced to Cambodia--not surprisingly, they're sold at higher prices. Most of the better quality flours I've seen in the local supermarkets are imported from France. This includes T45, T55 and T65. To date, I haven't spotted other types of French flour, besides cake pre-mixes. Further, with the help from a former food and beverage manager, I was able to find good quality rye flour, imported from Germany! Unfortunately, the company that sells it can only offer very large bags of rye flour. So, it's not quite suitable for individuals who don't bake often. I've no such luck finding other grains, such as spelt, quinoa, buckwheat, and the likes. But I'll continue seeking them out. Great looking loaf Kahlid...that's my kind of bread. I love making breads with multi-grain soakers so this one is right up my alley. Thank you , Ian! My wife loves any thing with multigrains too. You can't help it, can you? ;) i hope that this yeasted water rye would perform well. Can't wait to see your delightful experimentations. I will try to post tonight if I can. I baked it as a Miche but it may have been better in a pan since it was so moist. It came out very moist but a little denser than I would have liked but overall not bad. Lovely looking Rye bread, given all the ingredients. It is a rye with additional flavor to boot. 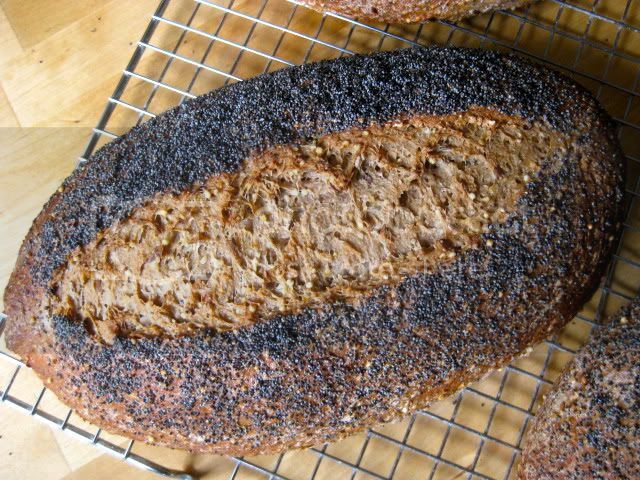 You've given the urge to bake a sour rye, thanks! I do this bread with some frequency (http://www.thefreshloaf.com/node/29843/multigrain-struan-wgb). A trip to a Whole Foods bulk aisle leads to weeks of experimentation with all the various seeds available. I'll have to try millet, thanks for the idea! Thanks, Loyd! I wish we had similar stores, with affordable variaties of grains. Everything here is overpriced, impotrted, and organic. P.s. the link you posted connects to my thread. 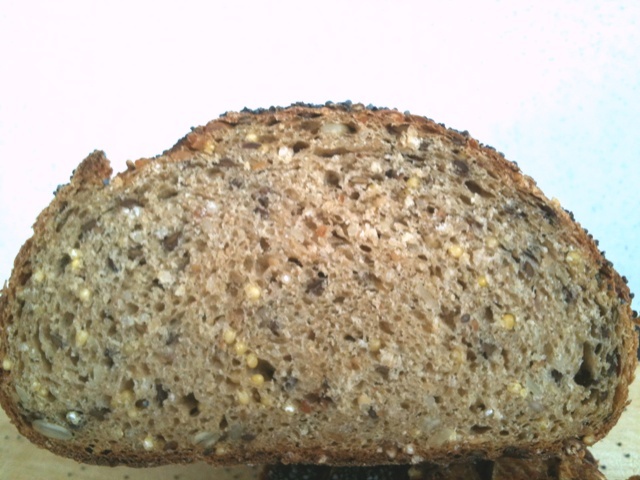 Meant it to be http://www.thefreshloaf.com/node/25548/multigrain-struan. The perils of multi-tabs. I bake this often, also with a sourdough starter, and, also, with uncooked millet (I like the crunch). 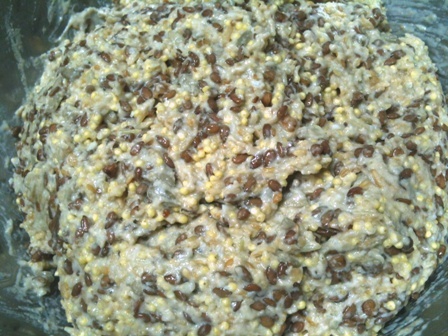 My grain mixture is a little different, apart from the whole wheat flour I use wheat bran, millet, sesame seeds, flaxseeds, corn meal, and a 7-grain mixture (cracked rye, cracked wheat, cracked barley, cracked corn, steel cut oats, buckwheat and flax). I also mix it in the machine, but I wonder why your loaf is so sticky that you recommend using a loaf pan instead of a hearth bread. Because of the sunflower seeds? They don't soak up much liquid, so that might account for a stickier dough. 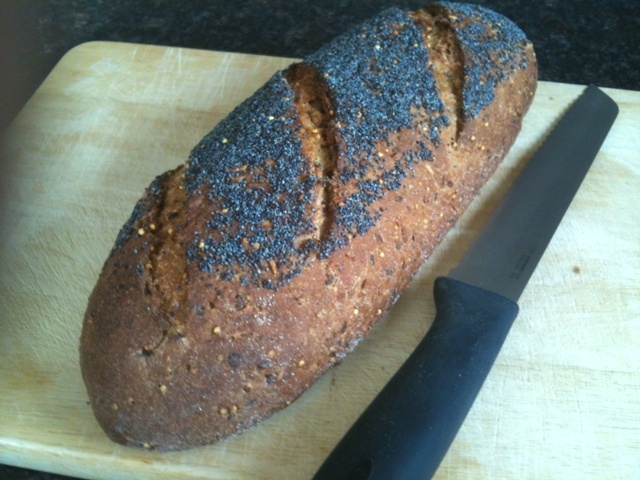 I totally agree with the egg white wash. You waste your precious poppy seeds if they don't stick to the loaf. Magnificent!! The Queen of Seeds and Khalid Mebake should bake a Combo Continental Struan to mmake the Irish wish they could eat as good an example in Ireland. Very nice baking of a great recipe. Way to go. Thanks, Karin! And what a lovely looking loaf of struan! True, it may have been the sunflower seeds. A Pan is easier with such doughs. Also, not much difference would be seen between a pan bake or a hearth one, as the bread Is ought to be moist and soft. I've never made this bread. It has been an oversight. Your loaves and Karin's are certainly inspiring. Thanks, David! This is one addictive bread, though takes some initial preparations, but it is certainly worth it. Very tasty bread; I like this book by Reinhart better than all his others. I had wondered if you'd used salt in the soaker; double-checking, I note this is what Reinhart calls for. I believe I would prefer to make this dough using a machine too. Thanks, Andy! Yes, salt is called for in the soaker. I've seen your latest blog... That is the longest post i've ever come across! I met with Derek inDubai, and he mentioned that he met you during his stay in England, and he seemed to have enjoyed your company. I like "Whole Grain Breads" best of Reinhart's books, too (baked every bread from it, except for some crackers). And you have to add salt to the soaker to prevent too fast fermenting. David, the struan is really good, you should definitely try it.